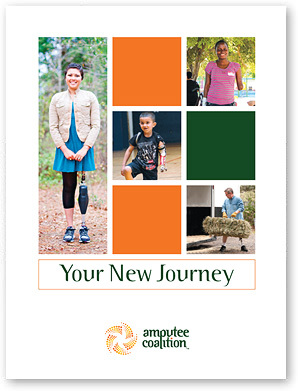 As part of our continuing mission to provide the best information possible to the amputee community, The Amputee Coalition has updated our new patient information kit. Inside this collection of select patient education materials, healthcare providers can find information to help educate and empower their patients. Amputee Coalition Agency Folder, with helpful information about Amputee Coalition Programs and Events. A letter of introduction from Charlie Steele, a member of the Amputee Coalition's Board of Directors. Brochures from our First Step Series, a series adapted from our Guide for Adapting to Limb Loss. Included will be The Strength to Carry On: Amputees Share Their Secrets of Success, a brochure carrying an uplifting message to amputees. A sample copy of the Amputee Coalition's bimonthly magazine inMotion An information request form with a return envelope. The Your New Journey folder is an introduction to the ongoing journey to not just surviving, but thriving with limb loss. The information in these packets is intended to help patients learn the importance of being an active part of the rehabilitation process and to make informed decisions about their healthcare. 2015, Folder.